Back in college -- or I suppose I should say, way back in college -- I had a class on the Philosophy of Art. I chose to focus on the writings of Martin Heidegger. Specifically, his essay "The Origin of the Work of Art" from Poetry, Language, and Thought. This 74-page essay turned out to be a revelation of sorts; less for the specific content than for the rigor involved to simply grasp what the hell Heidegger was talking about. I recommended this essay to a friend, Joe. He got around to reading it. Eventually. While in grad school. A few weeks in, I got an interesting note: "I'm reading through the Heidegger and I've cleaned up my entire apartment. Reorganized everything and cleaned it from top to bottom. I just found I couldn't think clearly with all the clutter." And this coming from someone who months prior said he only felt comfortable with a layer of dust covering everything. I miss college. In some ways. The Lamhorns from RL Acoustique pulled a real Heidegger on me. They actually snuck up on me and I didn't realize I had rearranged and reorganized my entire listening room to accommodate them. That is, until I put them back in the 'new' room, carefully positioned them and sat back near my new desk. Yes, I bought a new, smaller desk to make more listening room. And took a CD from my new CD rack (it takes up much less space). And sat back and hit play. "The design all started when I became fed up with trying to build a decent 3-way system with EdgarHorns called the System 100 in the early 90s. It turns out that I needed a sub to go below 100Hz. So I would require a fourth driver. This was getting a little much for someone who appreciated the simplicity of a low-powered single-ended AudioNote Kit One 300B amplifier. So I began investigating the other extreme and through reading Sound Practices and hearing my first Lowther-based cabinets, I fell in love with the sound. It was by no way perfect but it had the immediacy and dynamics I was missing in standard loudspeakers. So my quest began. "After reading all I could on the Internet, I found the Mauhorn designs quite interesting but wanted to improve on them. This led to my first horn, the Lamhorn 3.5. It had a horn length of 3.5 meters. Although quite good, the cabinet was 40" h by 12.5" wide and 32" deep and still not up to what I wanted. 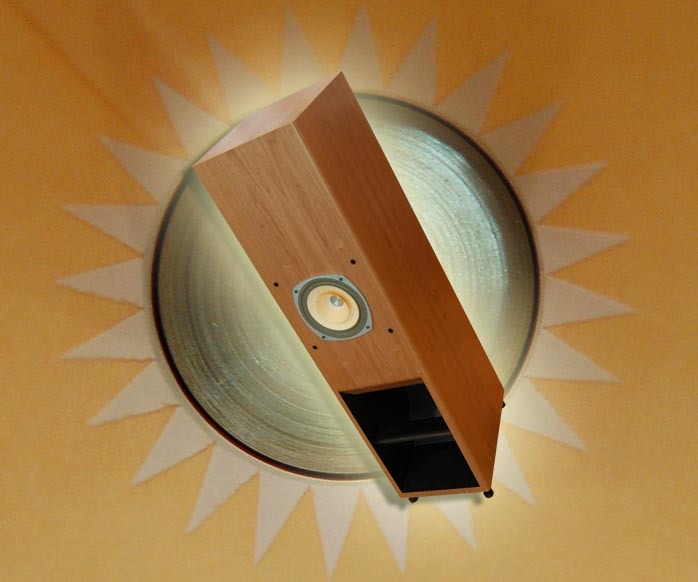 This design evolved into the Lamhorn 2.0 which at 60" was now much taller but only 19" deep. I did my first show in Malaysia with the Lamhorn 2.0 in 1997, accompanied by Allen Wright of the famed Cables Cookbook. I then experimented with shorter cabinets playing with different horn lengths to finish off at 1.8 meters. Hence the Lamhorn 1.8. This was in 1999. "I started the design process in 1996 with Lowthers -- the PM2A -- but then got in touch with Francis Reps who makes the wonderful R1. My cabinets suited both drivers equally well. 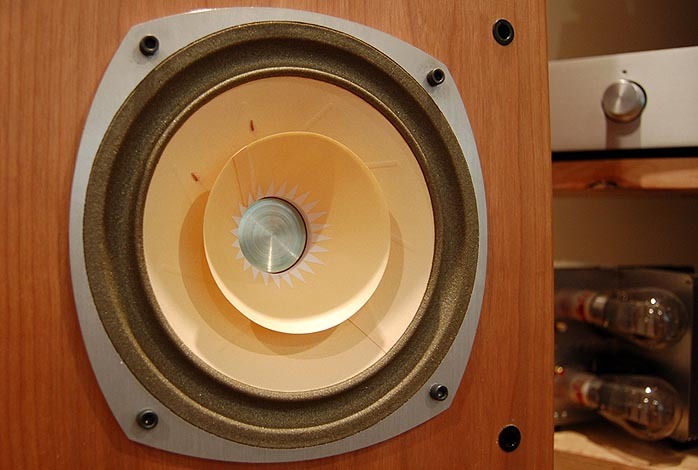 The internal labyrinth was slightly modified in 2000 to increase bass output. This did not come from my previous mathematical formulations but from experimentation. The math brought me as far as I could so I tried slight changes to see their effect. In fact, 44 different configurations in all. Those were meticulously measured and listened too. This is where Art Dudley talks about the Pipe [in his review of the Lamhorns in Listener March/April 2002]. The changes in effect divert the horn labyrinth concept into a hybrid design of pipe and horn. "I then caught wind of AER in 2001 - this German firm who purportedly made "better" Lowthers. Well, after trying the AER MK1, it was clear they were very good drivers but my cabinet was not quite right anymore. So it required repositioning the driver a little higher in the cabinet. 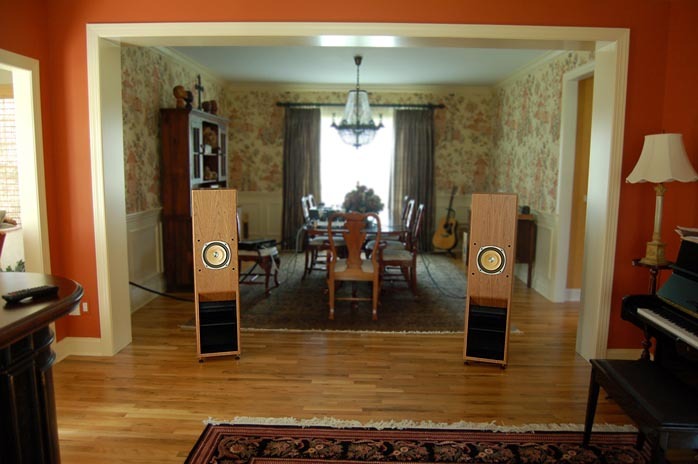 In fact, this last change improved not only the reproduction capabilities with the AER but also with the Lowthers and Reps."
The 1.8 cabinets are 50" high, 12.5" wide and 16.5" deep at the base, tapering to 13 ¾" at the top. Seen from the side, the front face of the Lamhorns has a gentle rearward slope toward the top. This seats the driver at a slight tilt or rake 30" above the floor when standing up on the supplied spikes and measured from the driver's center. I added a pair of Yamamoto ebony footers under the spikes to protect my wood floors. This made positioning adjustments a breeze. At 145lbs apiece, the Lamhorns on stilettos would love to couple with unprotected floors. The binding posts are Cardas Silvers and I actually left off the screw-down pieces since my banana'd cables don't need 'em. The entire cabinet is made from 1"/17-layer Brazilian Birch plywood. The review pair was finished in a natural Cheery veneer. Other finishes are available and include Red Oak, Black Oak and Rosewood (a $750 option). Internal wiring is pure silver with a natural cotton sleeve. Two of the internal braces are visible in the horn mouth, and there is a third up the road a ways. These cabinets are extremely rigid and sturdy. They were also obviously man-handled by UPS. Judging by the condition of the screw-in footers, they'd endured a few drop tests. The overall appearance is understated and elegant. I found myself prone to a quick rub or pat on the head each time I walked by (more on this strange behavior later). The Lamhorns are available with a few driver options: the AER MK-I as found in the review pair; the REPs R-1 which brings the price to $16,000 Canadian; and a variety of Lowthers including the EX/DX4 and EX/DX 3. Robert Lamarre has also used a custom Hemp driver (this was used for the Montreal Show in 2005) but the final production Hemp driver is still in development. Since I'd be reviewing one iteration, I asked Robert for comments on some of the other drivers. "As for the differences with drivers, the AER has the least amount of cone coloration. The Reps are second and the Lowthers -- with the new whizzer cone introduced a few years ago -- a close third. Where the AER marks a clear difference is in the 2.5 to 4kHz region. It has no peak at all. The others do. To some, the upper midrange peak in the presence region is fine while others find it objectionable. I must admit my favorite driver is the AER MK1 but in some systems where the amps are a little soft, the Lowthers and Reps can do wonders. I should add that because I use Tenor amps myself which are ruthlessly revealing, the MK1s are the best bet. It really is a question of system matching and taste." 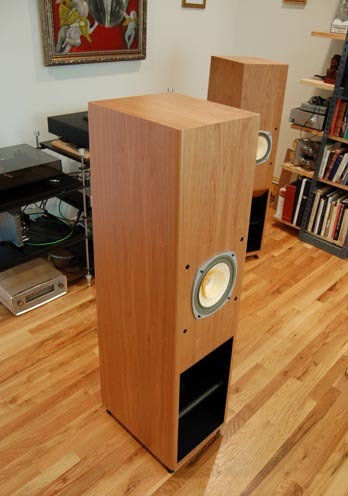 For $7,000 pr Canadian, RL Acoustique also sells the Lamhorn cabinet sans drivers. The AER MK-1 is manufactured in Germany by AER. Like the Lamhorn cabinet, this driver is beautifully built. 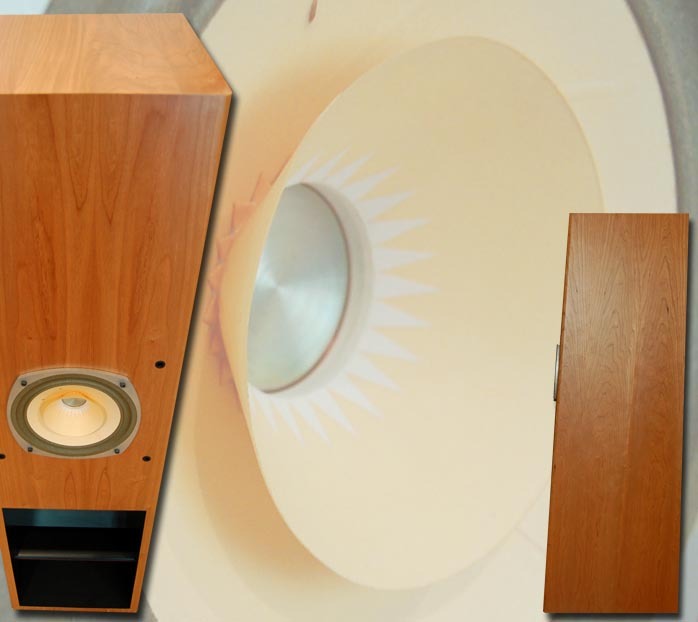 The AER website is currently in German only but I found this information on the Dutch BD-Design site very interesting: "All AER magnets have an extremely strong magnetic field, enabling the use of a pole piece that is thicker than the height of the voice coil i.e. all AER drivers have under-hung coils. The latest AER drivers all use very strong neodymium magnets. These magnets generate a magnetic field much higher and more constant than possible with ceramic or Alnico magnets. They are also much smaller (by up to 80%! ), making the AER drivers much lighter. Less weight, improved coil geometry and the magnetic strength of neodymium are not the only performance advantages offered by these magnets. The high purity (99.99%) of the iron material, while making the magnets harder to machine, is another major contributor to their dramatically improved electrical and mechanical performance which translates into their unparalleled sound quality. driver and horn mouth have coupled with all available air and taken over. In so doing, it sets the stage for the musical event like a silent roadie. I'm not talking about ghost-like imaging or a wide and deep soundstage (boy that word just bugs me lately). I'm talking about image density. The music and the musicians are embodied in the air. The Lamhorns are also extremely fast and detailed. Their ability to handle complex music with huge dynamic swings while setting the symphonic stage with separate and distinct players without smearing or blurring their voices is remarkable. Or perhaps unnerving is a more apt description. Close your eyes during Mozart's Magic Flute, and you can enter that magical place; poke around and put your focus where you like. Papageno prances around the room fleet of foot and Tamino is chesty and willful. And the vocal pyrotechnics of the "Der Hölle Rache kocht in meinem Herzen" ["hell's vengeance boils in my heart" - Ed.] reaching into the nether regions are breathtaking. As you listen and your attention shifts around the performance, the musical image holds a clearly defined sonic place for every player. If this all sounds a bit magical, I'm making my point. The Winterpills' [sig 1294] self-titled debut release has an air of melancholy, a sweet sadness. Featuring Philip Price and Flora Reed on vocals, the Winterpills blend spare instrumentation and poetic lyrics to create a dreamy and captivating mood. Every ounce of pluck and resonance of the acoustic guitar is revealed, the vocals of Price and Reed delivered with warmth and flesh. I have to admit to bringing a bit more baggage to this recording. Philip Price was another college friend I lost track of soon after leaving Vermont. Like looking at old photos, listening to Winterpills contains a bit of personal reflection. So let's just say that the combination of remembrance and presentation held my attention during a flood of warm memories. After all, one aspect of the hi-fi hobby which is perhaps more appropriately tagged the listening-to-music hobby, is stirring up emotion and memory. The aural trigger, like hearing an old friend's voice, can initiate thoughts and scenes that would otherwise remain locked away in memory. Music has the ability to lead us to places we wouldn't otherwise go. And having a clear window to look through makes for a stronger impression. Another less-than-attractive but equally enjoyable outcome of the Lamhorns' presence in the room region was being coaxed into sing-along mode more than ever (much to my family's amusement and eventual dismay). If this is too much for you, I don't blame you - but I thought it worth the mention. Nick Cave, Dylan and even KT Tunstall (yes, I can sing female lead equally poorly) all came out and tickled that infectious Karaoke bone that resides in all of us. The Lamhorns' way with vocals is as good as I've heard and does their Lowther heritage proud. Familiar voices sound familiar and the sense of person attached to the voice is captivating and solid. The full-range moniker is problematic. I much prefer the more descriptive single-driver categorization. So I am not going to suggest the Lamhorns give you full-range performance. I am going to suggest that what they give leaves very little to be desired. I've not heard stronger or more tuneful bass from a single-driver speaker and the Lamhorn's size belies the impact of its bass performance. Cue up a Jazz ensemble, something like Don Cherry's Art Deco. Charlie Haden's bass is big and woody. It's about as bassy as I've heard bass be. And there's no boom or bloat. It's at once fast and tuneful. It resonates. This recording is another Rudy Van Gelder wonder and retains a sense of the performance in every sense. The blurt of Cherry's pocket trumpet against James Clay's tenor sax backed by Billy Higgins on drums are captured and laid out in a you-are-there single-mike-sounding setup. Higgins cymbals are lithe and lit while all the thwaks and thuds resound and trail off in real time. There's no sense of foreshortening or the need for more shimmer. Reaching down even deeper, Kom Regn [fxcd 266] from Anne-Lise Berntsen and Nils Henrik Asheim pairs Berntsen's vocals with Nils on the 18th-century church organ of Maihingen. "So that hell will shake down to its foundation" from the liner notes by Nils Henrik Asheim. And with the powerful 4 watts from the Fi 421A, I shook our floorboards and seemingly the foundations of our home. These are ancient Norwegian religious songs, with Nils improvising on this ancient organ. The combination is stark and eerie. If bass is rolled off, you don't get the full effect or force of this recording. The Lamhorns delivered the power, glory and vastness of the place. Every last nook, cry and cranny. Now that I've gushed and glowed, I'll recompose and resemble some sense of reviewer's edge. You'll have to have associated gear that's very much up to snuff if you buy the Lamhorns. They won't take any crap without giving it right back in spades. I've said it before - the Lamhorns are ruthlessly revealing. If your amplifier tends towards lean, you'll get Jack Sprat coming out of your speakers. If your amp is bloomy and peaky in the midrange, expect exactly that presentation with bass the size and shape of a deflating hot air balloon. More than any other speaker I've had in my home, the Lamhorns give you an unobstructed view upstream. During my time with the Lamhorns, I had the opportunity to partner them with a variety of amplifiers; the Fi 45 and 421A; the Audio Tropic Musical Machine; the Tektron TK TK2A3/50S and TK2A3/50SI (using 45s, 50s, 2A3s, 300Bs and the Sophia SET Princess tubes); a push/pull EL34 based-amp (40wpc); the Minute from Thailand; and a mono pair of parallel SET 2A3s. For anyone with a score card, I'd pick the Fi 421A as the all-around amplifier for everything and anything you want to throw its way. The Fi 45 is also a wonderful partner and imparts a more full-bodied sound, leaving the bass a bit looser and less defined than the 421A. The Tektron integrated with NOS balloon 50s was a magical pairing, especially for less demanding music at modest volume. For small Jazz on vinyl, this was a killer combination. The Lamhorns also love space. They need room to breath. I have to believe they'd be much happier in a larger room and would certainly not recommend them for a room much smaller than mine. As a matter of fact, the only thing standing between me and a pair of Lamhorns, budget considerations aside, is my room. My goddamned room. I rearranged, adjusted and even bought some new smaller stuff in a failed attempt to make the space less -um, spatially specious. I also spent a fair amount of time tweaking the placement of the Lamhorns as they respond to minute adjustment. One issue I do have is the balance between image density and too much in-your-face edge. This was a delicate balancing act. Again, my feeling is my smallish room -- which is also my office/library and filled with stuff -- must be reeking a bit of havoc. Bass can be overwhelming on some material but this was also amplifier dependant. The Fi 421A kept things reined in and tight. The parallel 2A3s, while offering a nice punch, tended to render the upper end a bit too crisp and dry for my tastes. The p/p EL34 was flat out destroyed by the Lamhorns (brand name withheld to protect the innocent. Besides, it's not here for review). It sounding shrieky, thin and wholly uncontrolled in the bass. Volume. As with some hornloaded designs, the Lamhorns like to be goosed to sound their best. Not to beat a dead horse, but room size once again can handicap your system's ability to let loose. Oh how I wish I had a bigger room. I'm also a late-night listener with a family and no way to completely isolate my room from the rest of the house. So I listen at relatively modest volumes into the wee hours. While the Lamhorns sound fine soft, they really come alive and gel from bottom to top when played above speaking-across-the-room levels. And when they gel, the quantity and quality of detail and clarity served up demand attention as undivided as you can muster. Think intravenous connection to your tunes. The Cain & Cain Abbys throw out a much more ethereal musical aura. This allows some room for mental meandering. The Lamhorns' tight musical image tends to snap you back into the music more frequently and more abruptly. This effect may recede over time as one becomes more accustomed to their sound. But after three months, I saw no sign of this abating. Now this may or may not be a criticism. Depends on your tastes. I'll also say this is nothing like a lot of multi-driver speakers I've heard which I'd describe as overly analytical and musically arid. What I mean to suggest is that the sheer amount of detail and razor-like precision may be just too much for some people's taste. Before hearing the Lamhorns, I would have put myself in this camp. After hearing them, I realize there's really no such thing as long as the rest of the package is included. I never thought I'd have to make note of the potential for too much bass and too much detail when talking about a single-driver speaker. But there you have it. So yes, this is about as much of a rave as I've yet been tempted to rant. Practically speaking, I have very little to criticize. The Lamhorns come as close as any speaker I've heard to everything I always wanted from a loudspeaker but was afraid to ask for. Amazing body and density, superb separation, detail and dynamics, floor-shaking tuneful bass - and they can deliver all of that with a few good watts. They are also beautifully made, solid and attractive in an understated way. They don't scream anything except good music. The fact that the design is now going into its 10th year spells classic to me. As far as value goes, my feeling is that the first and foremost question to answer is - can I afford them? I know this sounds silly but I mean this quite literally. After that, it's a free for all. You make the call. 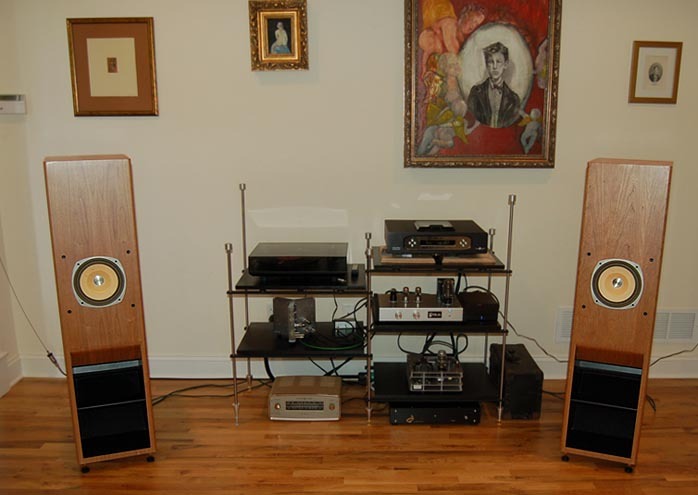 The passion that is the hi-fi experience has Art flowing through it. And some people are willing to pay dearly to live with Art that makes them revel. "Art is the setting-into-work of truth." Heidegger. I don't know what he means either. What I do know is that the Lamhorns made me think, reflect, sing and reminisce. Come to think of it, they made me do all the things music can lead us to do and they added room redesign to the mix. 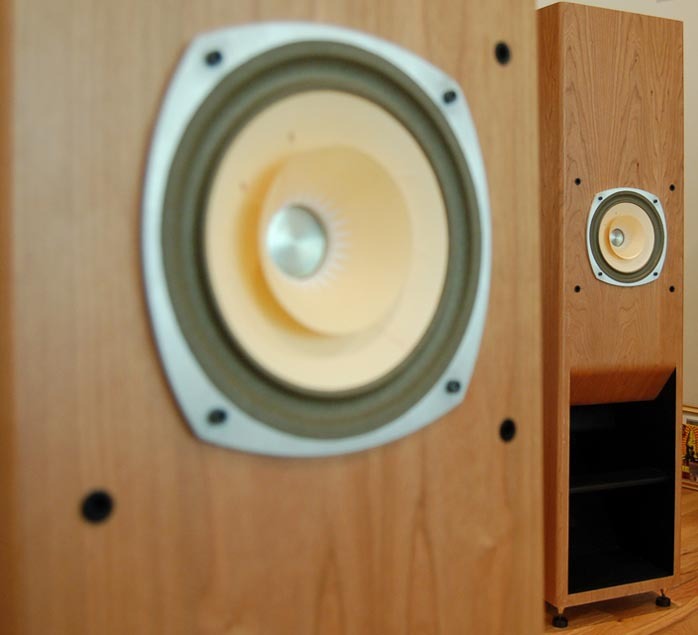 If you find yourself headed down the single-driver path, you can think of the Lamhorns as one very strong candidate for that last pair of speakers. Come to think of it, if you always thought single-driver speakers weren't for you because they compromise too much at the frequency extremes, the Lamhorns may change your mind if you can give them an ear attached to an open mind. Honey, I un-shrunk the listening room! Like that scene from Dirty Harry, "I've just got to know!" So I cleared out a room to make room for the Lamhorns. Their temporary setup -- yes I know, I can't them leave them here -- was in a room approximately 14' w x 35' d. All hunches were correct and all bets were off. Even in this not ideal very long wall setup, the Lamhorns opened up and relaxed. Air and volume expanded with the room and the impressive part was, everything good got better. Everything that was really good... well, you get the point. Space, the final frontier, is where the Lamhorns want you to explore your music. You can add dancing to that list of "embarrassing things the Lamhorns made me do." On a recording like Sera una Noche by La Segunda [M062A], the recorded space is presented in all its dimensions and the players within it stay put. The scale of each aspect is kept in check. There's nothing oversized except the recording venue, reflecting a sense of true-to-life scale. When you couple this presentation with voices that are distinct and true to their original, fleshy and soft or hard and distinct when called for, maybe I do get that Art is the setting-into-work of truth Heidegger thing. Your music is doing the setting-into-work of your thoughts on an elevator disappearing into the clouds of experience and memory (I purposely left out the truth part since it's so heavy-handed a word that you need someone like Heidegger and at least 74 pages to flesh out an introduction to that concept. Or write an editorial. I wouldn't want to come across as an opinionated simpleton). This temporary room also opens onto other rooms in our home and the sound flowing throughout remained remarkably involving. Even off-off axis, the Lamhorns gave me that there's a band in the other room sound. I've never heard another speaker do this as well. Typically, you get some muffling, smearing and the overall scale shrinks. Not here, not with these speakers. The Lamhorns are very refined and very fine music makers. The only obstacle to ownership beyond budget concerns fall to matters of personal preference. The sheer amount of detail and clarity, when given room to breathe, comes across as musically correct and captivating. For some, this may be more in your face than desired. If someone said to me "I'm looking for a relaxed presentation", I would not direct them to the Lamhorns - unless their idea of relaxation involved being totally enraptured in the music. As my time with the Lamhorns comes to a close, do you know what thoughts are running through my head? Damn, I didn't get to hear A Love Supreme or Live at the Fillmore East. So if you'll excuse me, I need to join the band in the other room before the Lamhorns take them away.